Johannes Ahrenfelt the authors of Innovate with ICT has agreed to answer questions on the book. 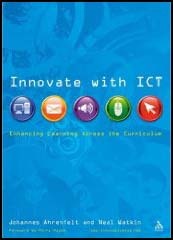 Innovate with ICT provides a highly practical sourcebook for using ICT effectively in the Secondary classroom. Section One shows exactly how to use specific applications creatively for stimulating resources. Section Two applies these applications to classroom practice. The other areas covered include effective planning and how key skills can be addressed using ICT.The majority of ICT books do a reasonable job of explaining how applications work. However, they leave the educator with a mental leap to make: 'How can I make use of this?' Sometimes this challenge is too big and leads to lessons that lack rigour or, worse still, the teacher abandoning ICT completely. This book uses hands-on tasks to explain how to use ICT effectively and in an engaging way. Section One shows how to employ different ICT applications to create exciting resources. The focus is on showing the benefits of each tool and how they can be utilised by teachers in both their preparation and lesson delivery. After every section teachers will have created a useful and interesting resource that can be used and employed in other circumstances.Section two, applies these tools to classroom practice. It allows teachers to approach ICT from the correct angle by allowing them to say, 'I want to develop thinking skills with the students, how can ICT help?' or 'Could setting up a Wikipedia assist in advancing students' independent learning skills?' This approach is much more effective than starting with technology and trying to fit the less content around it. This book, therefore, looks at effective planning and how key skills should be approached and addressed with pupils. Why do you think this kind of book is needed? What are the biggest challenges facing teachers in terms of using ICT? How important is ICT in teaching today? How significant will ICT become in the future? Neal Watkin and I aimed this book at teachers who are enthusiastic about using ICT but need support in doing so. However, it is not just for beginners, we have also tried to focus on some of the more advanced aspects of ICT whilst not getting bogged-down with the intricacies of the various software. We have worked hard at covering as many facets of ICT as possible to ensure that anyone would benefit from reading and working with this book. This is the reason why we deal with a range of tools such as Interactive Whiteboards, PowerPoint, Podcasting, Flash, video editing and many more. There are a number of fantastic books which show us how to become experts at using Microsoft PowerPoint, Adobe Flash, Dreamweaver and so on, but there are very few resources out there which give teachers the opportunity to create a resource which is specifically aimed at enhancing a particular skill, whilst at the same time showing you how to use a piece of software. which most frustrated teachers in relation to ICT. It is hard to find time in a world where teachers' workload seems to expand more and more. Sure, there are many websites and courses you could use and attend but it is the regular hands-on practice that is ultimately needed. One of the key reasons why we decided to write Innovate with ICT was so that teachers could pick out those applications that would aid teaching their subject and enhance students' skills. This is the reason why we have included most popular tools available e.g. online mind-mapping and website creation, PowerPoint, Movie Maker to name a few. Hopefully readers will realise that they don't have to spend lots of time honing their skills of e.g. Adobe Flash to create an interactive diagram or Drag & Drop. The book guides them through how to make a diagram then all they have to do is tweak it to suit their students. How important is ICT in teaching today? How significant will ICT become in the future? We know that students prefer to use ICT and that it can engage them, so if we begin to use it creatively and unpick the skills involved in creating a digital movie, or contributing to a Wiki, we end up with the essential ingredients for a lesson. Once we accept this we can make significant leaps forward. When we use ICT as part of the educational process we get exciting results. With the advent of Virtual Learning Environments (we all have to use them by the end of the year in Britain) and online mentoring, basic knowledge of ICT is essential. This will keep you going and ensure that you can use e-assessment and communicate well with your students. However, I think that teachers would benefit greatly by raising the bar further than that. The potential for mass collaboration between teachers across national borders is immense thanks to tools such as Wikis and online site creation like Keep Toolkit, or forums such as this one. Although this forum is busy with people sharing and discussion ideas, most teachers are not members of one. In fact, most teachers only use a web browser, Microsoft Word and PowerPoint, possibly Excel, for reasons mentioned in the first few questions. However, 'We' can change that together; a sort of staffroom approach would open many doors for many people by sharing and showing each other how we use ICT with our students.